For my husband’s birthday this year, he once again requested a chocolate cake with white frosting. 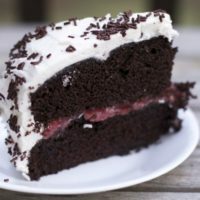 If you know me, then you know if I have made this cake in the past, I need to mix things up a little so we came up with this best chocolate cake with Strawberry Filling. 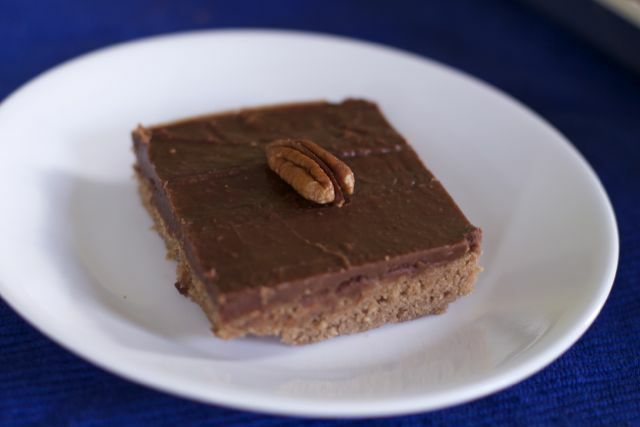 I have never made a filling for a cake, outside of a frosting like this German Chocolate cake. 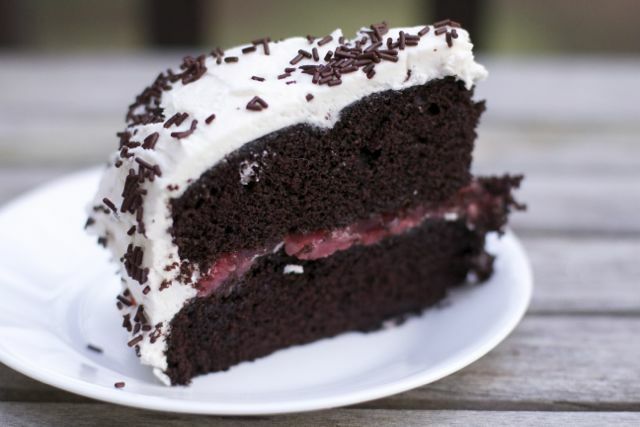 We created a rich dark chocolate cake filled it with a homemade Strawberry filling. To achieve his wish for White Frosting, well buttercream of course. (Disclaimer, I did try to make a cooked frosting and it did not work). Despite the mishap with the frosting, by far this was one of my favorite cakes yet. 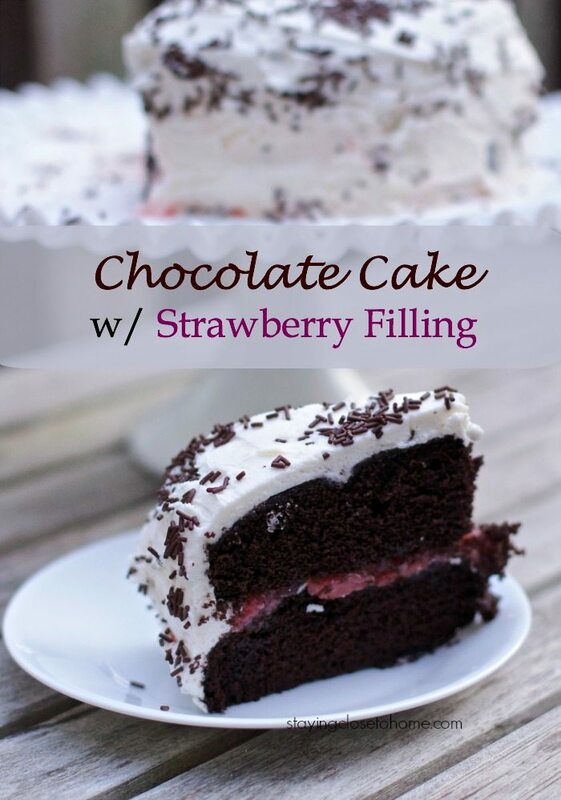 By far this was the best strawberry filling for a chocolate cake I have tried. I just love making a dark chocolate cake with a little coffee in the batter. Coffee really brings out the chocolate flavor and creates a dense batter. The steps are pretty simple to make this cake, just be sure to add parchment paper to your pans and spray the sides well. 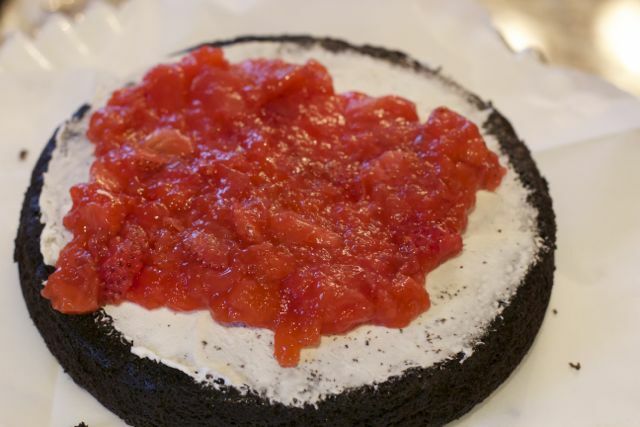 While you are baking the cakes, make the strawberry filling. Heck, you can make this strawberry cake filling a few days in advance. You want the strawberry filling to sit in the fridge to set up perfectly. The recipe I used made enough strawberry filling for two 8 inch cakes, so we used the extra on some waffles. Not sure which way I enjoyed it more. I had fresh strawberries but you can use frozen strawberries as well, just not the ones with sugar syrup. I am sure this recipe would work for raspberries or mixed berries if that suited your tastes. 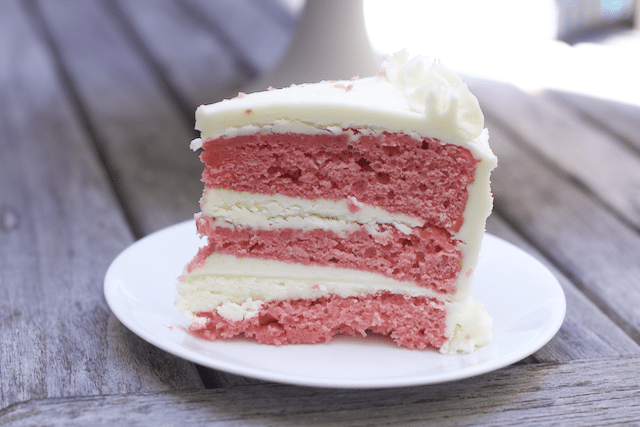 Assemble the cakes by adding a nice layer of strawberry filling. 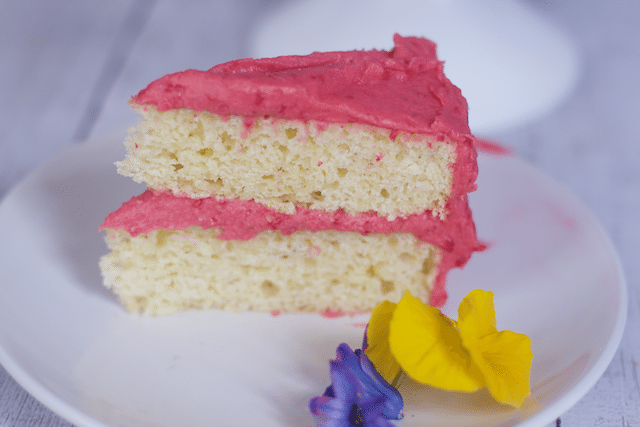 Use a small layer of frosting on the bottom cake layer, just to prevent any soggy cake layers. My husband thought I put too much as I had some challenges getting the frosting not to mix with the strawberry filling. OH well, this is what makes it homemade. Since we did not use any frosting for the filling, this cake had a great thick layer of white buttercream frosting. Of course, he wanted to have chocolate sprinkles, so that was the extent of the decorations for this dark chocolate cake with strawberry filling. 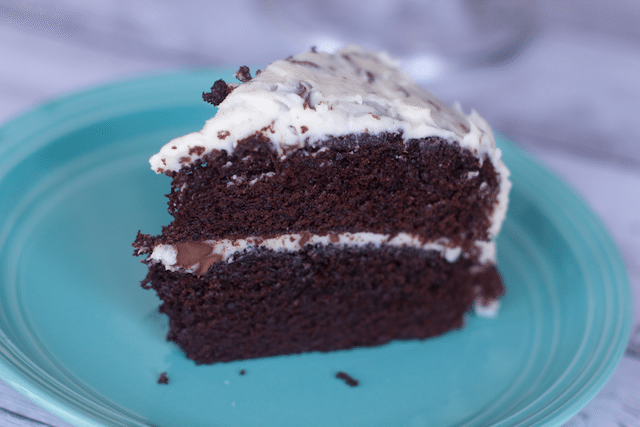 Slice into this decadent yet delicious dark chocolate cake for your next special occasion. Trust me this might be a keeper for your birthday too. 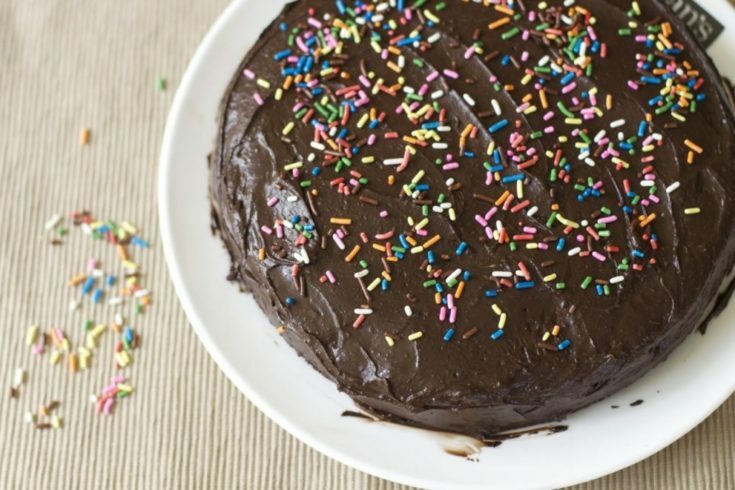 Other chocolate cake recipes you are going to want to try! An incredibly impressive cake that is not that hard to make. 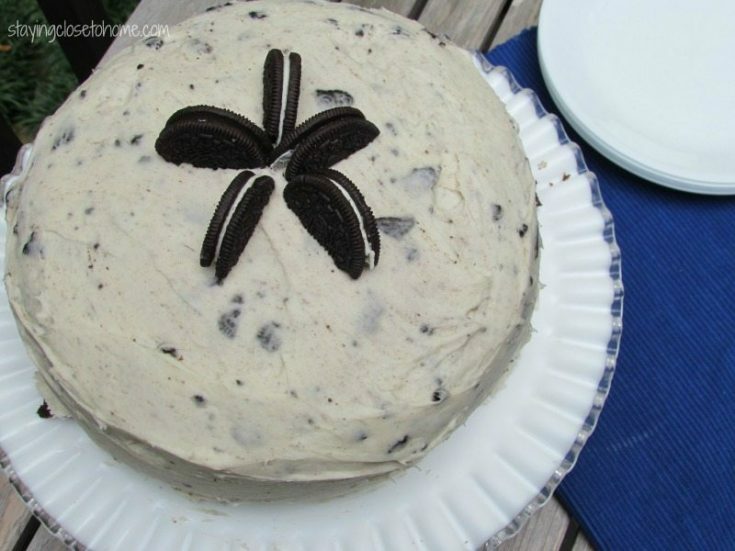 The perfect birthday cake recipe. Heat oven to 325. Grease two 8-inch round cake pans and line with parchment paper. Grease the parchment. In a medium bowl, combine the chocolate and cocoa powder. Pour the hot coffee into this same bowl and whisk to combine. Stir in the buttermilk until smooth. In the bowl of a stand mixer fitted with the paddle attachment, beat the butter and sugars on medium-high speed until fluffy, about 3 minutes. Add in the eggs, one at a time, mixing well and scraping down the sides after each addition. Mix in the vanilla. Scrape down the bowl and mix again for 30 seconds. Add in the flour in three parts, alternating with the chocolate mixture. Divide the batter among the prepared pans. Bake for 35-40 minutes, rotating halfway through, until a toothpick inserted in the center comes out clean. Transfer to a wire rack and let cool for 15 minutes. Turn out onto the rack and let cool completely. Whisk water and cornstarch together in a large saucepan. 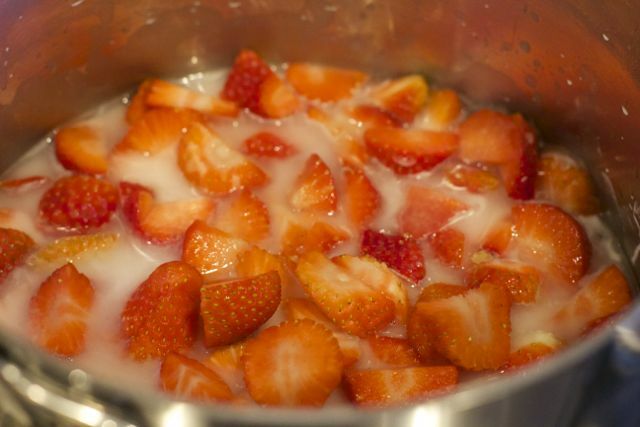 Cook strawberry mixture over medium heat until thick, about 10 minutes. 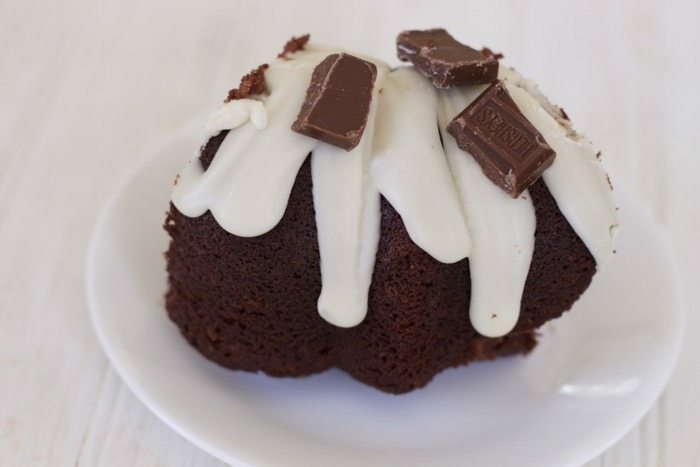 What is your favorite cake combination? 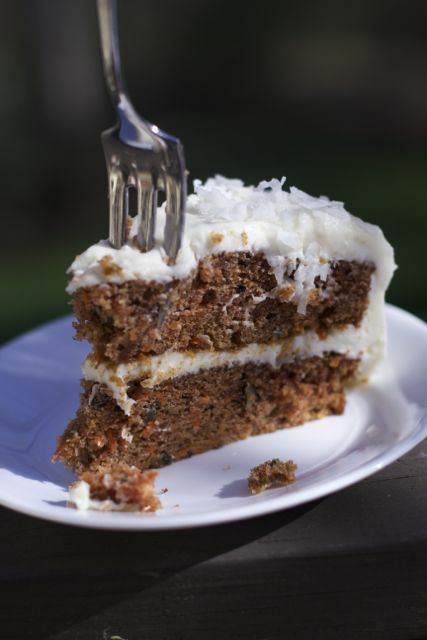 Some of our favorite homemade cake recipes we have had for birthdays and just because. « Can Natural Pest Control be Successful? Everything here looks scrumptious, and your pictures really are great – got me drooling here! I would have to see if I could make a gluten-free version that would hopefully taste as good. Thanks for the compliment on my post. . I love chocolate with strawberries. This sounds like the perfect cake for my birthday next month! 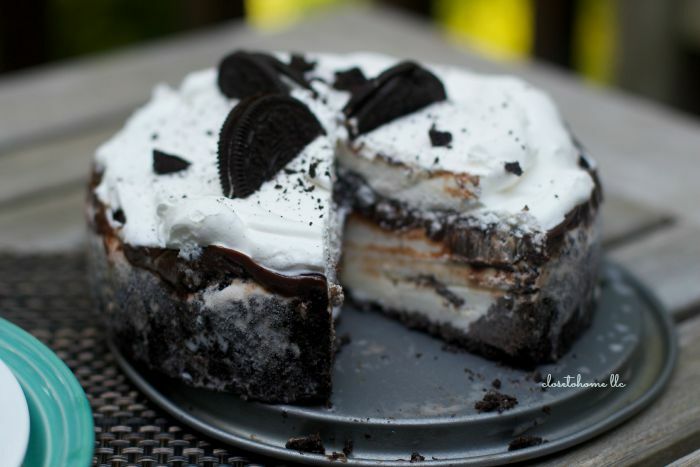 This cake looks divine! I would love if someone made this for my birthday! thanks so much Tracy, I was thrilled to have a little strawberry filling left over too. Turned into a special birthday breakfast too. It’s been way too long since I’ve had chocolate cake. I could devour that right now. 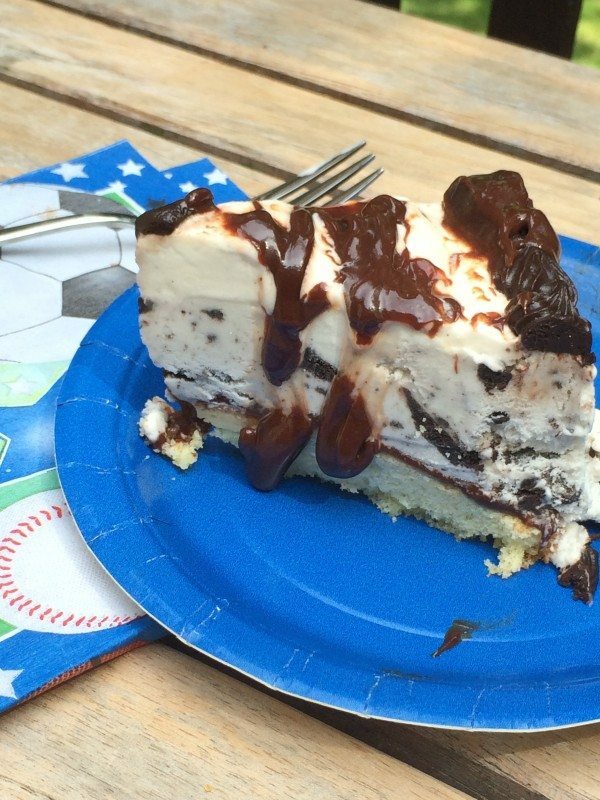 Thanks for sharing the recipe with us. This looks amazing! This cake sounds wonderful. 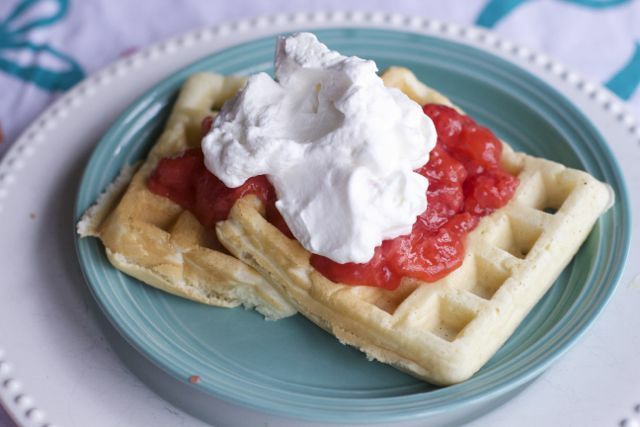 I love the strawberry filling that can double as waffle topping (strawberry is the best waffle topping, if you ask me!). 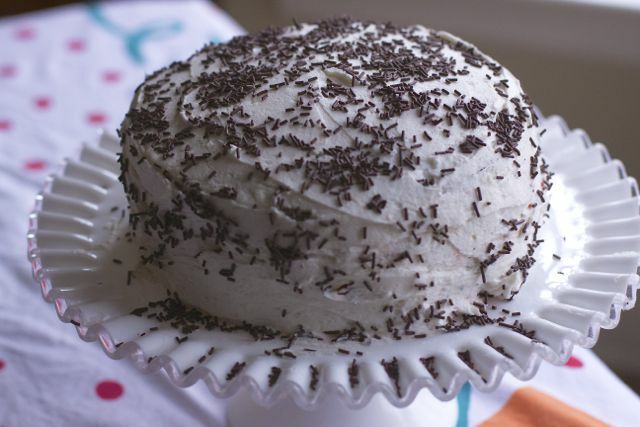 Chocolate and strawberries are one of my favorite combos, so this must have been absolutely delicious and can’t fault your husband for wanting chocolate sprinkles. They make everything better! I’m not a fan of fruit in my cake, but this is my wife’s favorite combination. Especially with German Chocolate! What a gorgeous cake! Looks so scrumptious! Strawberry anything makes food taste that much better! OMG – this looks amazing!!! The pictures are fantastic! !